China's Health Ministry said Monday it had sent 10 emergency medical teams to quake-hit Wenchuan County in southwest China's Sichuan Province. The teams comprised medical and epidemic prevention experts from the Chinese Center for Disease Control and Prevention and local health bureaus of Tianjin, Shanghai, Guangdong and Shandong, a ministry spokesman said. The ministry said it was organizing more back-up teams to help with the rescue efforts. Immediately after the quake, the Sichuan health bureau dispatched 13 medical contingents of 40 people to Wenchuan county. The ministry urged the teams to assess casualties and the medical needs of the victims and to make arrangements accordingly. It also promised to closely monitor the situation in affected provinces and to coordinate the medical relief work. The Ministry of Public Security issued a notice on Monday requiring local police authorities to put the protection of life and the maintenance of social order in disaster-affected areas as priorities. The notice ordered police to ensure smooth passage for vehicles carrying disaster-relief workers and materials to affected areas and to harshly deal with anyone taking criminal advantage of the quake. Anyone found to be fabricating and spreading rumors should also be harshly dealt with according to law, said the notice. The Ministry of Land and Resources has warned of risks of geological disasters after the quake on Monday. In an emergency notice issued Monday, the ministry asked local authorities to carry out accurate geological and weather assessments to identify possible risks such as landslides. The ministry ordered its provincial branch to immediately send experts to the quake-hit region to assess geological disaster risks in temporary accommodation areas. The government of Hong Kong Special Administrative Region (HKSAR) said late Monday it will offer every possible assistance to the victims of the major earthquake that occurred in the Chinese mainland's Sichuan Province on Monday afternoon. According to a press release from the Information Services Department of HKSAR government, it will closely monitor the situation and the disaster inflicted by the earthquake. The HKSAR government will respond quickly to the latest development in the disaster areas and offer every possible assistance to those places, the press release said. The HKSAR government also said it will cooperate with related departments in the mainland in the disaster-relief work. The quake, measuring 7.8 on the Richter scale, jolted Wenchuan County at 2:28 p.m. on Monday, according to the China Seismological Bureau. 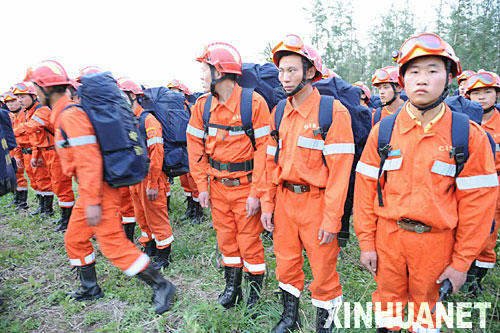 China's Chengdu Military Area Command has dispatched 5,000 troops and armed police to help with disaster relief work in earthquake-stricken Wenchuan County, in the southwestern Sichuan Province. Armed police forces stationed in Sichuan province have dispatched 2,900 personnel, while regular army personnel made up the rest of the detachment. Tian Yixiang, an officer with the emergency office of the People's Liberation Army (PLA), said the troops would assist local authorities in gauging the situation and helping with disaster relief work. The Military Area Command sent two helicopters to Wenchuan on Monday afternoon. Later Monday afternoon, the General Staff Department (GSD) of Chinese PLA urged military personnel in Sichuan Province to make every effort in disaster relief work in Wenchuan. "All troops and armed police in the province should devote themselves to reduce the losses incurred by the earthquake and to protect the safety of life and property of those affected by every means," said the GSD order. It ordered troops and armed police stationed close to the quake-hit areas to prepare reinforce those already dispatched when ordered or requested by local government. A major earthquake measuring 7.8 on the Richter scale jolted Wenchuan at 2:28 p.m. Monday, the China Seismological Bureau said. The epicenter of the quake was located 31 degrees north and 103.4 degrees east. Tremors were also reported in Ningxia Hui Autonomous Region, Qinghai, Gansu, Shanxi, Shaanxi, Shandong, Yunnan, Hunan, Hubei, Yunnan and Jiangsu provinces, Shanghai and Chongqing Municipalities, and the Tibet Autonomous Region, the CSB said. 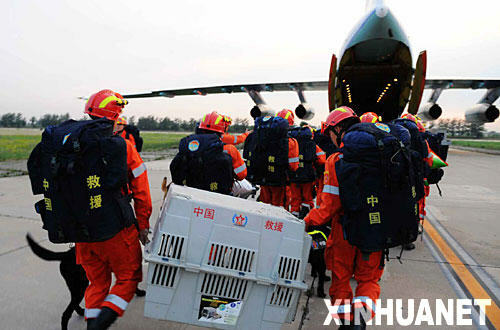 An earthquake emergency relief team of 184 people is to leave Beijing from Nanyuan Airport in two military transport planes on Monday night to travel to quake-stricken Wenchuan County in southwest China's Sichuan Province. A quake measuring 7.8 on the Richter scale jolted the county at 2:28 p.m. Monday, the SSB said. The epicenter of the quake was located at 31.0 degrees north latitude and 103.4 degrees east longitude.